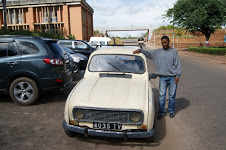 My friend, sociology professor Richard Samuel, asked the question (in French) as our Renault 4L taxi hurtled down a cobblestone hill in Madagascar’s capital, Antananarivo, dodging pedestrians, parked vehicles, and hand carts hauling furniture, metal fencing and sacks of charcoal. It was a jarring, noisy ride. I gripped the door handle which appeared to have been re-riveted to the frame more than once. At the bottom of the hill, the driver crunched into low gear, and began a slow climb. I told Richard I had never seen a 4L in the US. His question puzzled me but, as I looked out at the chaotic traffic, I realized why he had asked. In his urban landscape, the 4L was a dominant species. When I traveled in France in the 1970s, the Renault 4L was a common sight. With its functional, box-like design, it sat high (for its size) on its chassis, its front end inclined downwards as if it was getting ready to dive into the muddy farm fields. It was introduced in 1961, aimed at the lower end of a market dominated by the two-cylinder Citroën 2CV, the celebrated deux chevaux (two horses), a small front-wheel drive saloon marketed as a people's car in the same class as Germany’s Volkswagen Beetle. The 4L, like the 2CV, was seriously underpowered, taking several minutes to reach its preferred cruising speed of about 80 kilometers (50 miles) per hour. Once it made it, it chugged along happily, using much less gas than anything else on the road. The gear shift on the 4L and 2CV was a challenge—you pulled it out directly from the dashboard, then twisted it left and right, forward and backwards, in a complex series of motions. In my 20s, living in Britain, I owned first a 2CV and then the slightly up-market (but no more powerful) Citroën Diane. I soon became expert at the contortions required to shift gears. I visit my sister and her husband in southwestern France every couple of years. These days, it’s unusual to see a 4L or 2CV on the road, although I’ve spotted a few rusting in barns. But they are still the most common taxis on the roads of France’s former colony, Madagascar. Many are veterans of the traffic wars with battered panels and spectacularly out-of-whack alignment. You try to forget that there’s almost no suspension and just marvel that the car is still running. The history of the French automobile industry lives and breathes—or rather wheezes—in Antananarivo and other Madagascar towns. I’ve seen other Renault and Citroën models, the Peugeot 204, 304 and 404, and even an occasional Citroën DS (Goddess), the sleek, streamlined car with a hydraulic system that looked years ahead of its time when it was introduced in the mid-1950s. Some have a dodgy electrical system that requires wire-twisting to start the engine. In Toliara, on the southwest coast, one taxi driver told me the alternator on his 4L had long ago expired; each day, he manually recharged the battery, providing enough juice to start the motor but not enough to run the headlights as he navigated the darkened streets. Another proudly showed me how he could pull the key out of the ignition of his 1990 red Peugeot 404 without any effect on RPM. There are gas-guzzling SUVs on the roads of Antananarivo, most of them owned by politicians, business owners and aid agencies, but in a country where all indicators—unemployment, poverty, health, literacy—put it in the “least developed” category on global indexes, you’re fortunate if you can move up from a zébu (ox) cart to own a 4L or a 2CV. The last ones came off the production line in the early 1990s, but still command high prices on the used-car market, more than $2,000 for a model with a few dents, a cracked windshield and worn seats. With spare parts no longer available, except from specialty dealers at high prices, how do drivers keep their cars running? The answer is bricolage (from the French verb bricoler, to tinker), loosely translated as do-it-yourself. The auto parts trade, Richard said, is controlled by Indian and Pakistani shopkeepers who import parts from factories in Mumbai and Karachi. Many either fit the old cars or can be made to fit with a little bricolage. For that service, you go to a metal fabrication shop that cuts and welds made-to-order fencing, pipes, market stall frames, and agricultural implements. They can take a Tata or Mahindra part and make it work for your 4L; if not, they’ll just make you a new part. When cars eventually break down and cannot be repaired, the parts are salvaged and resold. “In this economy, there’s almost always a new use for something,” said Richard. Madagascar’s roads are hard on vehicles. On the maps, the Routes Nationales (RNs) are confidently marked in solid red, suggesting adequate connections between population centers, but just a few miles outside Antananarivo, vehicles slow down to dodge the potholes or mudslides. In the south, some RNs are little more than dirt roads, bone shaking in the dry season and mud-rutted during the monsoon. The most common form of public transport is the taxi brousse (bush taxi). Common throughout Africa and Asia, it’s a privately-owned minivan that plies a fixed route, picking up and dropping off passengers. There’s no schedule; the taxi brousse leaves when it’s full, or when the driver figures he has enough passengers to make the trip profitable. These vehicles lumber along the RNs, with luggage, bicycles and yellow bidons (jerry cans used for carrying water) lashed to the roof, piled so high that they look as if they will tip over on a curve. Which they sometimes do. To navigate the roughest RNs, you need a vehicle tougher than a taxi brousse. On my journey south on RN7 to Toliara, my comfortable Nissan Patrol passed a small boxy, high-riding bus, lumbering up a hill. “Fort Dauphin,” remarked our driver, naming the mining and administrative center on Madagascar’s south coast. The bus was packed with passengers squeezed onto narrow bench seats, luggage piled high on the roof. I asked how long the 700-mile trip would take. “Four days,” said the driver. That’s four days and four nights. The bus makes rest and meal stops but travels through the night, the two drivers taking shifts. At least the bus had suspension to soften the ride. Throughout the south, the standard and cheapest mode of long-distance transport is the camion-brousse (literally bush truck). It’s a military transport or freight truck with a rigid frame outfitted with bench seats; passengers are exposed to wind and dust and bounced around violently. Public transport at its roughest. It makes you almost nostalgic for the 4L. Coming in 2019, Monsoon Postcards: Indian Ocean Journeys--history, culture and travel tales from Madagascar, India, Bangladesh and Indonesia.